From the kitchen of One Perfect Bite...Strange things happen when food bloggers are housebound for long stretches of time. The food they feature can get fringy and the names used to describe it can become downright silly. That would never happen here, of course. We strive to give the food we make, names that perfectly describe the dish that is featured. Now I know that the name of today's recipe seems strange, but if you take a good look at the accompanying photo I think you'll agree the title perfectly fits the subject. 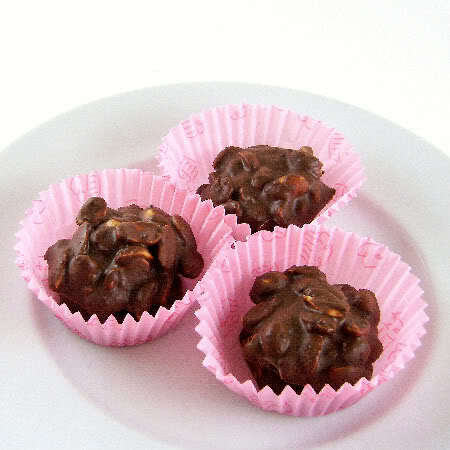 I'm featuring the mice today, because I wanted to make finger food for Sunday's game. I thought poppers would be a perfect addition to a spread that was starting to look a bit like old Mexico. Years ago, I'd deep fry poppers and everyone loved them. The trick here was to come with a version that could be baked but still retain the delicious crunch that everyone loved. With all due modesty, I have to say I was successful, but I was really disappointed with the anemic appearance of my poppers. The next time I make these I'm going to season and toast the bread crumbs before using them to coat the peppers. I will also remind myself that smart people wear gloves when they work with large numbers of hot peppers. The ingredients, particularly the seasonings, I used are meant to be suggestions. I hope those of you who are tempted to try this recipe will make it your own with herbs and spices that are to your liking. These are very easy to make and they can be prepared days before you actually plan to use them. Here's the base recipe. 1) Remove and discard upper third of peppers leaving stem intact. 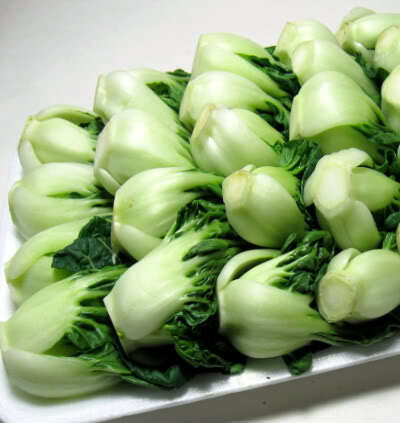 Remove ribs and seeds. Set aside. 2) Mix minced onions, garlic, fresh herbs, dried spices and both cheeses in a large bowl. 3) Fill each pepper with cheese mixture, mounding with a spoon. 4) Beat eggs and milk together. Set up a breading station with flour on left, egg mixture in center and bread crumbs to right. Lightly coat peppers with flour, dip in egg mixture and then coat liberally with crumbs. Place on paper-lined tray. 5) Bake for 30 minutes at 375 degrees F until golden brown and bubbly. You can also bake them for about 20 minutes then freeze them. Frozen poppers can be reheated at 400 degrees F for 20 to 25 minutes,or until they are golden brown. Yield: 15 to 20 poppers. Those look delicious - love that they are baked too. Ciao Mary, I love the name of this dish! Mary these look so delicious! 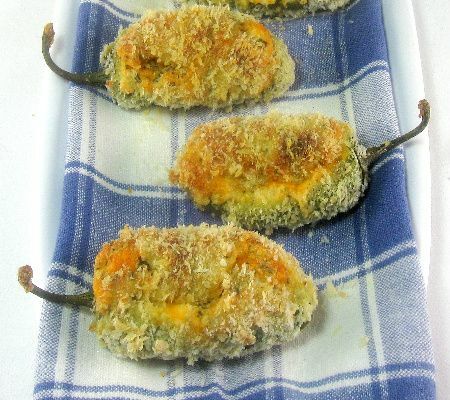 Jalapeno poppers are such a great snack - and the name is perfect for them. I've made jalapeno poppers just once and I adore them. Cute title. Yum! I love anything with chillies in it and these look great. Why are they called poppers? I want to eat these right now, I've always loved the combination of the hot peppers and the bland, creamy cheese...enjoy your weekend! Your jalapeno poppers look fabulous! Glad you mentioned the gloves... critical! Another tip.. use a grapefruit spoon to scoop out the "innards" of the jalapeno. The serrated (sp?) edges make it easy. Great idea on toaating the bread crumbs. I'll do that. Do you know Billy Collins' poem I Chop Some Parsley While Listening To Art Blakey's Version Of "Three Blind Mice"? I love the title because the poppers do look like mice. I grow jalapeños in our garden in Maine every summer. Now I'll have an easy recipe for some of them. I bet these are great. Wish I could eat spicy food. I have to remember to save the "tails" next time I make poppers. And bake them. And wear gloves. Happy Super Bowling! These look like as good a reason as any to be housebound! I love poppers and these look fab. very cute! have a wonderful weekend! We might just have these at our private Super Bowl party. We'll probably eat them while watching Downton Abbey on PBS rather than the end of the game. Yes, we will have a library opening gala and many other events. It will be such a pleasure to have the room to do a lot of programming. That's what a library needs today. It's more than just books. The name fits the food perfectly, love it. May be you could toss in some paprika or cayenne to add color to the bread crumbs. Like the fact that they are baked not deep fried. I love the title! These poppers look exactly like 3 blind mice! :) Love it! Take care and have a good weekend! What fun party food, Mary! The "mice" are too cute for words!! Somehow I've never heard poppers called that...what a fun name for a fun dish! My husband would be all over these - def bookmarking this one! Thanks for sharing! Mom these look delicious and super cute!! Absolutely gorgeous!this recipe is fabulous. LOVE IT! Oh my, hope it didn't get to your eyes! Rub your hands with spoonful of salt after dueling with hot chili peppers. It helps to reduce the spiciness from your hands. much. I was looking for this ρaгticulaг іnfοrmation for а ѵery long time. Thank you and bеѕt of lucκ.